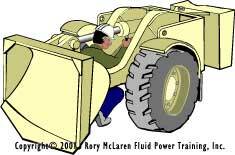 Topic: Air bleeding a hydraulic cylinder by allowing the cylinder rod to free-travel. A maintenance technician suffered a non-injury accident as the result of an accident he caused while he was installing a new cylinder on a production machine. During the process of removing the old cylinder and installing the new one, the oil drained out of the lengthy transmission lines that transported the oil from the directional control valve to the cylinders. He installed the clevis pin on the closed-end of the cylinder, and planned to install the rod-end clevis after purging the air. The cylinder rod was fully retracted in the cylinder tube. The new cylinder had no oil inside of it. The technician connected the empty hoses to the cylinder. He started the power-unit with the objective of purging the air out of the system by repeatedly extending and retracting the cylinder rod. When he activated the directional control valve to extend the cylinder rod, there was no immediate response. After a few seconds, the rod began to move. It picked up speed rapidly, and continued moving even after he shut the oil flow off. The rod literally blew out of the end of the cylinder, shearing the four tie-rod bolts. An investigation into the cause of this accident determined that the pump flow entering the air-bound transmission lines, compressed the air ahead of the oil. When the pressure overcame the initial resistance to move the cylinder rod, the compressed air expanded, causing the cylinder rod to accelerate at high velocity. The victim had been reportedly instructed to air-bleed a hydraulic cylinder by allowing the cylinder rod to "free-travel." An assembly-line worker suffered a lost-time accident as the result of an accident he caused when he was installing a hydraulic steering cylinder on a front-end loader. He attached the closed-end of the cylinder to the rear frame assembly with a clevis pin. The rod was fully retracted in the cylinder tube. He asked a colleague to start the engine and turn the steering wheel. The objective being, to push the cylinder rod out to meet the front-frame anchor point so he could install the clevis pin. As his colleague turned and released the steering wheel, the cylinder rod extended very erratically. It would pause and then suddenly lunge forward a few inches. Each time he turned the steering wheel, the same thing would occur. As the cylinder rod clevis neared the anchor point, he signaled to the helper to pause. He needed to rotate the rod-eye slightly to align it with the anchor. He placed his hand over the end of the rod-eye to guide it, and used a pry-bar to rotate the rod. As he placed leverage on the rod with the pry-bar, the rod assembly unexpectedly lunged forward, pinning his hand in-between the rod-eye and the frame anchor. The accident claimed four of his fingers. An investigation into the cause of the accident determined that the trapped air in the cylinder caused the cylinder rod to travel erratically. 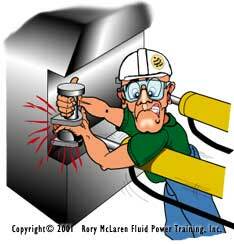 When the assenbly-line worker paused to align the rod-eye, the oil pressure compressed the air. However, the pressure generated by the compressed air was not sufficient to overcome the initial resistance that was needed to overcome seal resistance. The action of rotating the rod with the pry-bar generated the force needed to overcome seal resistance, and the pressure generated by the compressed air caused the cylinder to move unexpectedly. A diesel mechanic suffered a non-injury accident as the result of an accident he caused while he was working on a giant front-end loader. The accident occurred while he was attempting to troubleshoot the two massive, bucket roll-back/dump cylinders, by trial-and-error. Apparrently, it was reported that the cylinders were causing the roll-back assembly to operate erratically. He decided to investigate the possibility that the problem was caused by air trapped in the cylinders. He removed the rod-eye retaining pins from both cylinders with the intention of allowing the cylinders to "free-travel" to purge the trapped air. When he activated the directional control valve lever to extend the cylinder rods, the right-hand rod traveled its full stroke and stopped. As it stopped, the left-hand cylinder rod immediately extended. However, it appeared to travel at a much greater speed, and it did not stop! The entire rod assembly shot out of the cylinder and tumbled into the front-frame assembly. The giant rod weighed an estimated 800 lbs. This incident was never investigated as an accident. However, it was determined that the root-cause of the original problem was that the nut that fastened the rod to the piston had worked loose and unscrewed. When the mechanic attempted to purge air from the cylinders, the system pressure ejected the cylinder rod from the cylinder tube. These are not isolated cases by any means, so exercise extreme caution when air-bleeding a cylinder. It is safer to air-bleed a cylinder when both the closed-end and rod-end are securely fastened to their respective clevis anchor points. If there is ever any doubt, consult the cylinder or machine manufacturer for guidance. It is always wise to error on the side of safety.